500 men, 32 counties, 4 sporting legends, the Queen’s favourite fishmonger and a Lord Mayor. 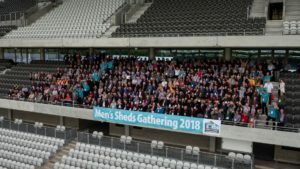 Pairc Ui Chaoimh has never witnessed anything quite like the Men’s Sheds Gathering 2018, which brought all the aforementioned to Cork for two memorable days of fun and camaraderie. Ably compered by Irish Country Living editor Mairead Lavery, the event reflected the enormous strides made by Irish sheds in the space of just a few short years. Michael Ring TD, Minister for Rural and Community Development, opened proceedings via a short pre-recorded video, lavishing praise on the movement and its impact on communities. Other speakers included Lord Mayor of Cork Clllr. Mick Finn, Fergal Fox of the HSE, David Gillick, Finbarr Kennelly of Haven Pharmacy, Topline ambassador Donncha O’Callaghan and philanthropist Alan Kerins. Four sheds – Kilbeggan, Rostrevor, Dundalk and Ballina – awed the crowds with tales of their achievements, achievements which many in the audience could relate to and, indeed, match. Throughout the day, hundreds of men thronged our Malehealth.ie.ie Expo, where dozens of partner organisations had set up stands offering resources, advice and freebies on all aspects of men’s health. 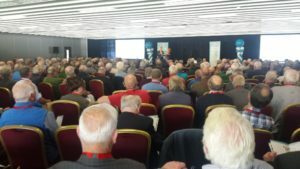 Day one of the Gathering closed with a gala dinner at Rochestown Park Hotel, while day two included tours of Co. Cork attractions for those who stayed on.